I've been using this product for about 4-6 weeks now, certainly long enough to decide if I like it or not. This first popped onto my radar when Fleur de Force did a bathroom tour and mentioned it. She really liked it and was a little confused as it claims to be so many products in one, and it's in a can. When Beauty Bay had a big sale on their Macadamia products, I snapped up another tub of the masque and I thought I'd give Flawless a try. It claims to cleanse, condition, refine and perfect, so as well as being a conditioner, it's a bit of a treatment too. You get 250ml of product in the can which is pretty decent. The consistency is similar to a mousse, but a lot thicker and doesn't expand much at all (only after you've put the cap on!). 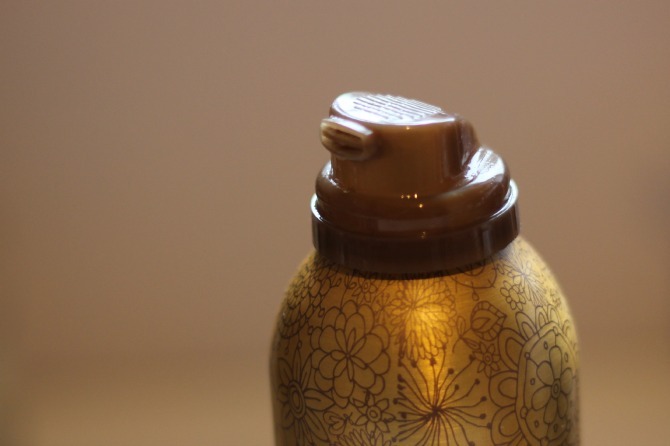 And just as you'd expect, it uses macadamia and argan oil. 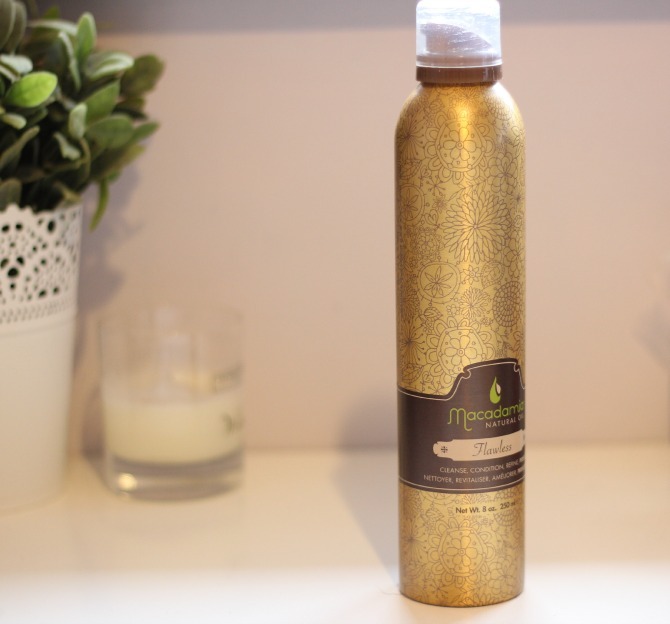 The first couple of times I used this, I did get quite a burning sensation on my scalp which made me really nervous as I've had a full blown chemical burn (a few years ago) from a well known hair salon. However, we figured out what it was. Remember my experience with the Yes to Cucumber face wipes? 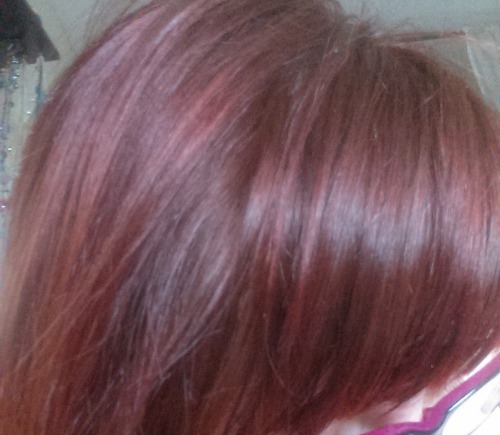 Well, the eczema that gave me worked its way backwards into my hair (yeah... that was fun). So my scalp was sore and sensitive (I probably shouldn't have used this then). I rinsed it immediately (as soon as the burning started) and my scalp felt fine. I left it a couple of weeks until my scalp had recovered (from Yes to Cucumbers, not this) and tried it again. This time it was fine. 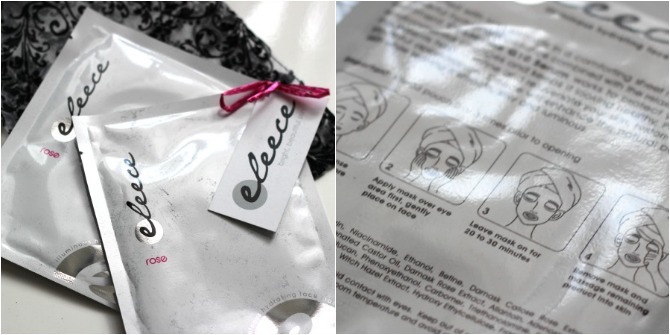 What's also nice, it's paraben free. The can I bought is the biggest one they sell, and retails (on Beauty Bay) for just over £16, I honestly think it's worth every last penny :) It might just be my all time favourite hair care product. I thought long and hard about writing this post, but you know what? In the 2.5 years I've been blogging, and since set up a second blog (www.mummy-pixie.com) I've learned a lot, I've seen what works and what doesn't, so I thought I'd share my tips with you. This isn't an exhaustive list of everything you could do, but it's a list of pretty much everything I do. This is a biggie. For me, my blog didn't really grow until I took to Twitter. It took me 6 months to get to 50 followers, it was about then I discovered how amazing Twitter is. It's great for discovering new blogs, making blogger friends, and sharing your content. Take part in the chats like #bbloggers (8-9pm Weds and Sun) and engage with other bloggers, share links to your posts on there using different hashtags like #bbloggeres & #fblchat. I'm hoping you have a Facebook page set up for your blog? If you don't, I'd recommend it. Yep Facebook throttles how many of your 'likes' will see each of your status', but Facebook is great for social signals in SEO, just like Twitter and G+ etc. So set up a page, update it every time you publish a new blog post, and engage your readers by asking them what they're up to, or sharing little snippits from your life. Don't be afraid to share your recent posts with different Facebook groups like #Bbloggers, FBL Chat and others. As much as this isn't a massive one, it's great to have an Instagram account - you can add your blog URL into your profile, and share images from your blog posts, as well as images from your day. These days, I'm probably spending more time on Instagram than I am Facebook, it's a lovely way to engage with people. 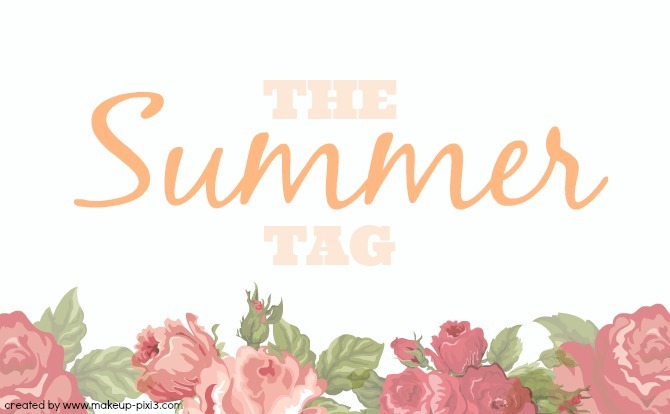 Don't forget to add hashtags to blog related pictures too like #bbloggers etc. Again, I was an early adopter of this, I've been 'stumbling' for about 8+ years now (great way to discover some of the most random sites on the web!). Just log in to your account, and on the right hand side (far right) there is a down arrow, press that and 'Add a page' - you can only do about 7 pages a day, so get in the habit of doing it every day, or once a week. This will get your page indexed so that other 'stumblers' might stumble upon it. If you want to expand your reach further, taking out a sidebar banner with another blogger can be effective. If you're not sure who to advertise with, don't be afraid to ask a blogger for their stats, i.e. how many visits they get a month etc, or have a look and see who's advertising with them, and ask how many referrals they've had. Back when I used to advertise with Sprinkle of Glitter, I'd get between 200-300 visits from her blog. With The Black Pearl Blog, about 150-200 (but I'd be paying £10 instead of the £25 sprinkle of glitter was charging). Other blogs didn't really send me any traffic, so it's a bit of a learning curve. But even if people don't click on the link to visit, they may remember your blog name and click on a Twitter link or Facebook link another time as it'll be familiar to them. Doing a short blog series is useful too. A couple weeks ago I did my 'Summer Series' - I had a big uplift in traffic that week. People like a theme and like to get involved, just make sure the series doesn't go on too long. It doesn't have to be every day, but could be one post a week on a theme for a couple of months. Last but by no means least, scheduling tweets and Facebook posts is a must. 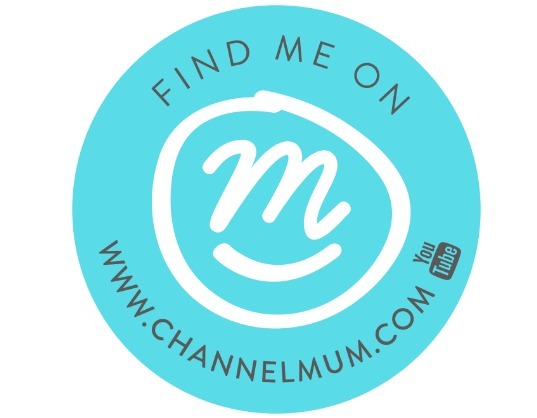 I trialled it for a week to see if it worked, and I had a big uplift in my traffic. Remember that you'll have readers from all over the world, where their day is our night, so even just scheduling tweets throughout the night will help. Don't be afraid to tweet out some of your older but more popular content throughout the day too. I tend to tweet my 'SEO tips' and Google analytics posts, they're always popular, what you'd call an 'ever green' posts, in that it doesn't really age. Yes I keep them updated with current trends and changes, but the essentials are still the same. If you read blogs there's a fair chance you'll have heard of Makeup Revolution by now, they've created quite the storm in the blogosphere. When I initially heard everyone raving about them, I just thought they were another MUA, possibly even the same brand (since MUA are the same as Vivo and several others), alas that doesn't seem to be the case. 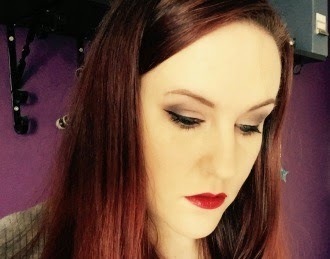 They lovely people from Makeup Revolution sent me a more than generous package of products to review, and whilst I haven't gotten around to trying them all out, what I have tried so far I really like. 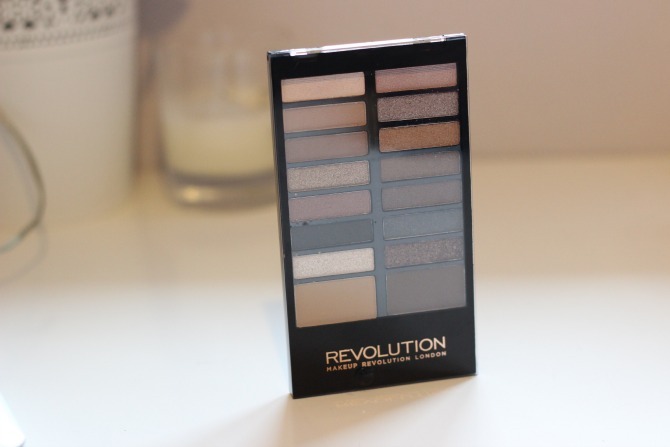 This is the second palette I've delved into, it's a small(ish) 14 eye shadow neat palette ideal for weekends away or overnight stays. 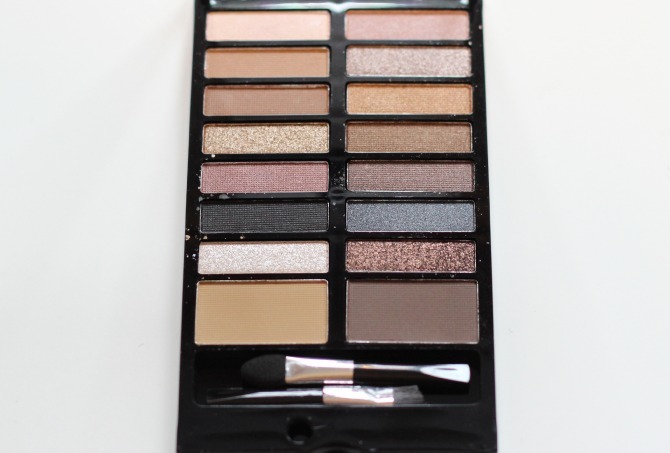 It'll fit snugly into your makeup bag giving you a lot of options for different looks on the natural spectrum. It also comes complete with 2 brow powders, but I haven't tried these out yet, I find it hard to stray from my HD brow palette! What I've been most impressed with is the quality. Don't get me wrong, not every shade is a killer for me, but overall they're really decent. My favourite shades in this palette are actually a bit flakey, but even with that, I've had very little fallout from them. Some of them can have that same buttery quality that Urban Decay have become famous for. The longevity of the shades is really good too, lasting for hours (with a primer). They're really easy to blend with and achieve a range of different looks, although the one above is my favourite so far. It's also worth nothing, the shade on the right hand side, 2nd down is a great dupe for Urban Decay's Sin shade (one of my favs). 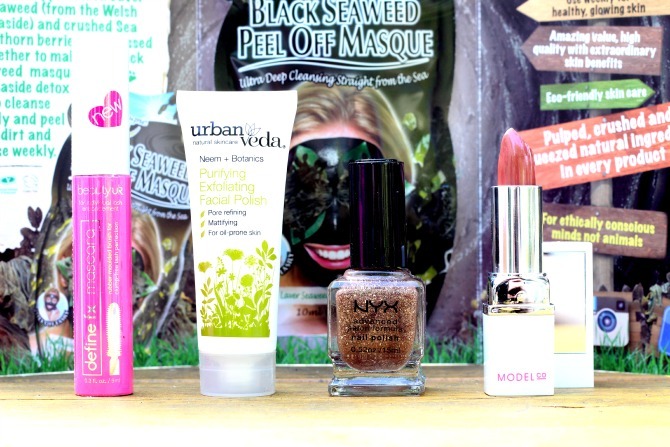 Once again this months Love me Beauty box* did not disappoint! One thing that really separates this box from others is the fact you can pick which one you want before it's sent to you. 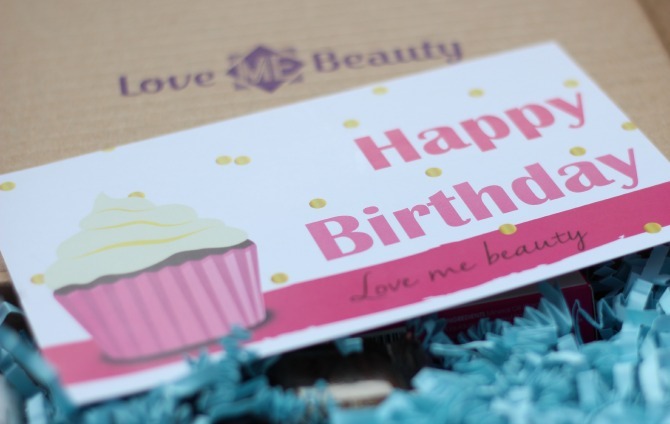 Yes, you may not get everything perfect, but if there's that one shade of nail polish you want or lipstick, you can pick the one that suits you best :) Also, it seems it's Love me Beauty's first birthday this month, so Happy Birthday love me beauty! Really happy with this box, looking forward to trying the facial polish, nail varnish, mas.... well all of it! Can't believe I was about to write a list of the contents of the box... ah well. I'll try to get around to reviewing these separately (well, the mascara and lipstick anyway), so keep your eyes peeled! 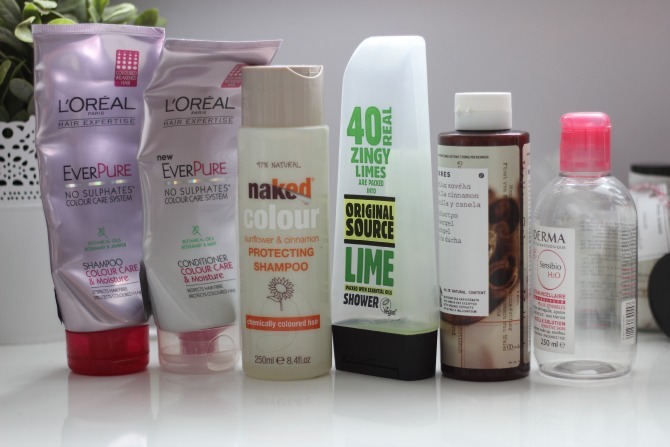 I'll be honest, I don't always remember to save my empties (bad blogger), however, I do have a bit of a stash to share with you and a quick summary on what I thought of each one. This smelt lovely, like cinnamon, mmmmmmmm, but, and it's a big but, it didn't lather very well. I'm afraid lots of these products were a bit of a labour to get through :/ Would I buy it again? Maybe... it's good for stripping back my hair but I feel that it needs a very good conditioner to go with it, as after rinsing the shampoo out, my hair was feeling quite straw like. This must be my... 4th bottle I've gone through, I'm close to finishing another one, and I have 2 backups in the cupboard that I bought when I was in France in Jan, so there'll be more empties of these to come! It's a good product, great at getting eye makeup off, even pesky waterproof mascara, however I always make sure I cleanse afterwards as I don't really like the way this makes my skin feel (slightly sticky). I decided I needed to invest in some really good skincare, not a £5 Nivea one that was no-longer working, but something a little better than that. 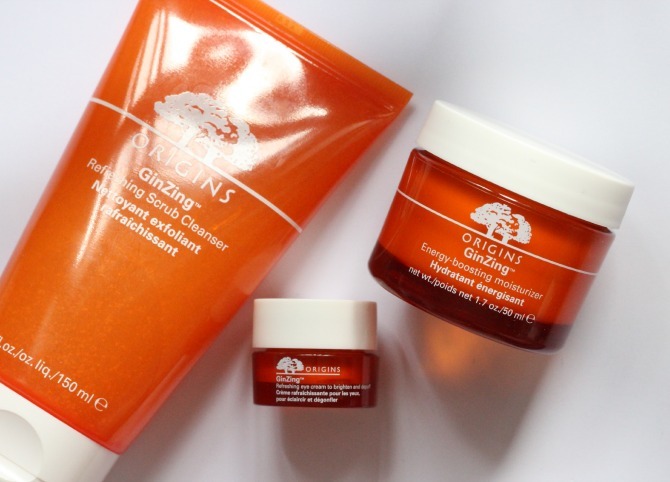 So I headed to the Origins counter and explained the trouble I was having with my skin and what I was after. They recommended the Ginzing energy-boosting moisturiser. I wasn't after a gel-type texture, but after trying this on the back of my hand (and smelling it!) I was sold. She also showed me the newly released Ginzing facial scrub cleanser, it's gentle enough to be used daily but good at polishing off any dry skin. Well, she demonstrated it and once again, I was old! I've been using this day and night (the lady on the counter said it's fine to do that) and can honestly say, I adore it. It sinks right into my skin leaving no oily residue at all in a matter of seconds. It smells wonderful (think clementines) and a little really goes a long way. It's formulated without: parabens, phthalates, propylene glycol, mineral oil, paba, petrolatum, paraffin, dea, synthetic fragrance and animal ingredients - so pretty free from the nasty stuff. What I love about this, you know how sometimes with gel-like moisturisers, if you put them on at night, and then in the morning wash your face, it feels kinda slimy when you're rinsing it? Well, that doesn't happen with this, it feels like instead of just setting on your skin, it really absorbs and does some good. I've been able to wear foundation again thanks to this little pair getting rid of a lot of my dry skin, and it's reduced redness on my skin and made my skin a lot more even. I really can't rave enough about these two, in my opinion they were worth every penny. I'll be buying replacements before the baby comes while I can still afford it! I don't wear that much jewellery, I have a respectable collection, but there's not that much I wear on a daily basis. These three picks are the pieces I'm reaching for more than anything at the moment. 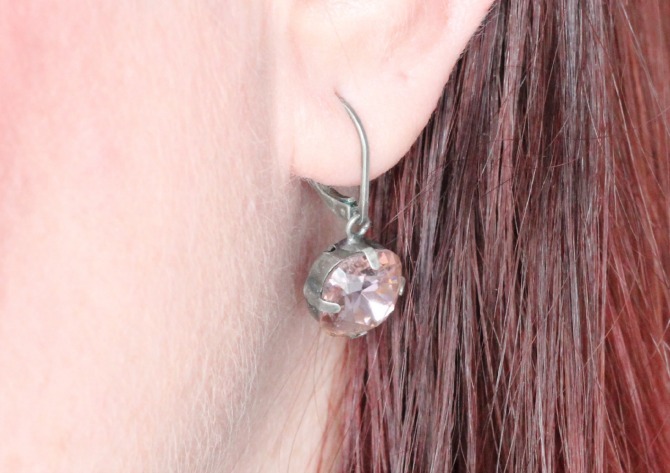 Sadly, I have no idea where you can get these, I bought them from a jewellery party a few years ago that I hosted, I think I paid around £4 for them. I also have a purple pair, but these go beautifully with my DR necklace (above), they're simple, understated and yet a bit of bling too :) I love earrings that clip up at the back like these do, if they're the normal kind (drop) I lose them so easily as I usually wear scarfs and they seem to pop them out. 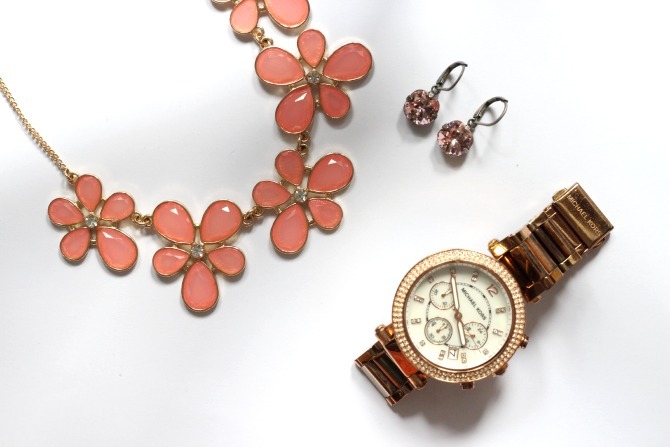 What's your go-to piece of jewellery? 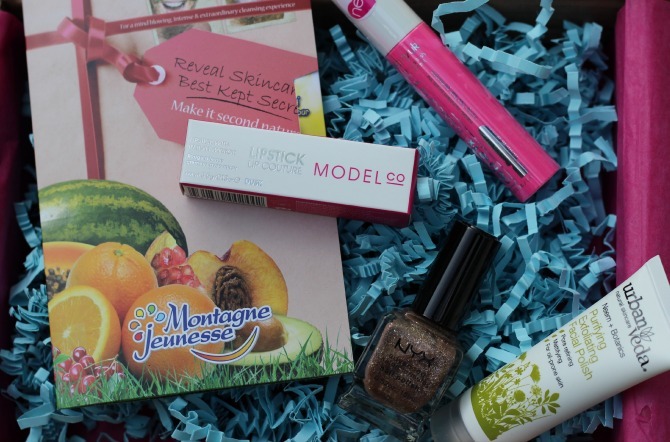 This months box was put together by Melissa Raymond, she's a YouTuber from the channel 'Melmphs Knows Makeup'. It's all about enjoying the heat and having a glowing complexion. This month sees fewer products in the box than in previous months, but that's not necessarily a bad thing :) As with every month, you receive 4-5 FULL SIZE pieces of makeup. So, here's a look at what was in my box. One half of this is a wax, and the other a powder. I haven't tried it so can't comment on what it's like but I was impressed that they sent me a colour that's appropriate. I see Tarina is playing on her Tarantino surname here, with the blusher being named after a Reservoir Dogs film character, I like it :) In the set you have a bright pink cream blush and a powder highlighter. The cream blusher feels lovely (when swatching), very luxurious, well pigmented and a lovely bright colour. However, the highlighter felt like compressed glitter, not something I'd personally use. I'm not a fan of having a powder product next to a cream product either, they always tend to get mixed up. 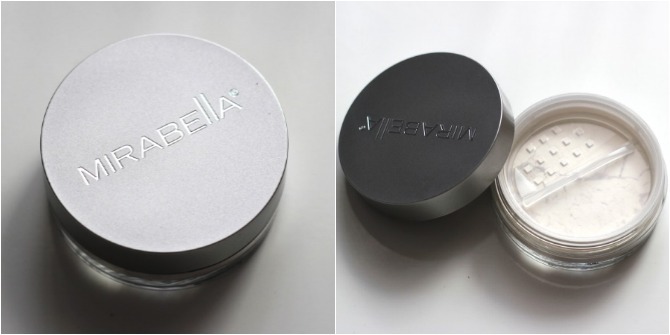 Described as a 'weightless setting powder' that gives you an instant glow (apparently) and has anti-aging ingredients in. It's a loose powder (which I like), I'm looking forward to seeing how this does compared to my fav setting powder, the Japonesque velvet touch finishing powder. What did you think of this box? Have you tried Wantable yet? Whilst this might not have the same ermergherd awesomeness that the Bourjois 1 seconde mascara has, there's something about this I adore and I'm completely drawn too. The way it flicks out my lashes, gives them volume and an almost butterfly flutteryness, it makes my lashes look really pretty and not fake. It coats onto the lashes like a dream, just gliding on effortlessly covering the lashes. There's little-to-no fallout with this too, so after a days worth of wear, your cheeks should look just as perfect as when you put this on. Now, here's the downside (lets face it, there's always one isn't there!? ), it's the price. 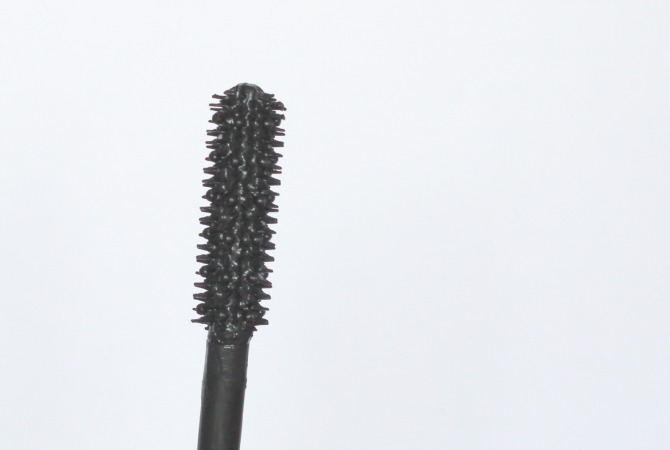 This is a pretty expensive mascara, coming in at £25.50*, that's quite a tall order! Would I replace it when it runs out? If financially things were like they are now, yes I would. But in reality, with the baby on the way and us losing around £700 a month of income once she arrives, these will be a luxury I'll no longer be able to afford. 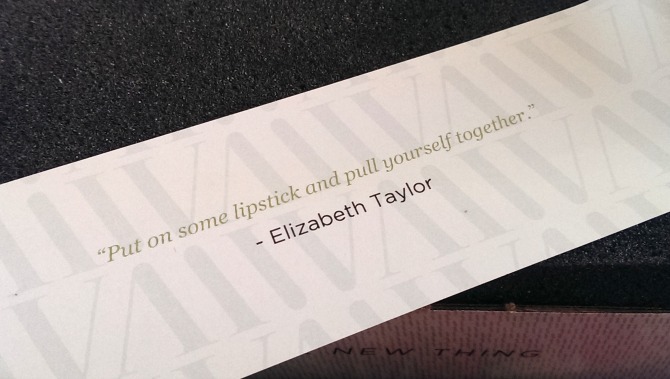 In fact, I'll be lucky to be able to replace any of my makeup at all. Anyway, we'll just brush that under the carpet :) So I've been mixing things up a bit recently, wearing less makeup, some days I'm even venturing to work without any on! Sadly, those days I often get comments saying "You look ill, are you ok?".... yeah, thanks for that boost of confidence! lol, anyway, after not wearing foundation for a long time due to having horrific skin, I'm now wearing it again thanks to a new and improved skincare routine (you literally wouldn't believe the difference, if I'd had the confidence, I'd have done before and after photographs), whoop! Just not as often as I used to. I wanted to see how few products I could get away with using that would stop people saying that I look ill, seems 5 is the minimum. So here's what I used. This created a great base for me that set matte, and lasted all day with only minimal patting of my nose and forehead (something I have to do with every foundation I ever wear, in fact, even if I'm not wearing foundation I have to do this). 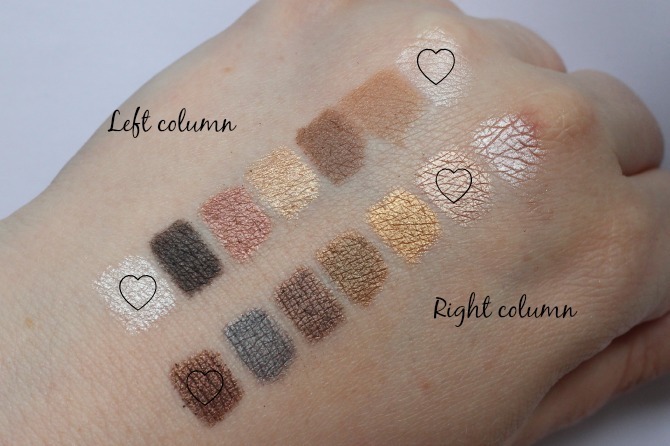 For this I only used one shade, which was the 3rd from the left, similar to Urban Decay's Sin - a soft natural slightly shimmery shade. I wanted the lashes to stand out and my eyes to look bright and alert. 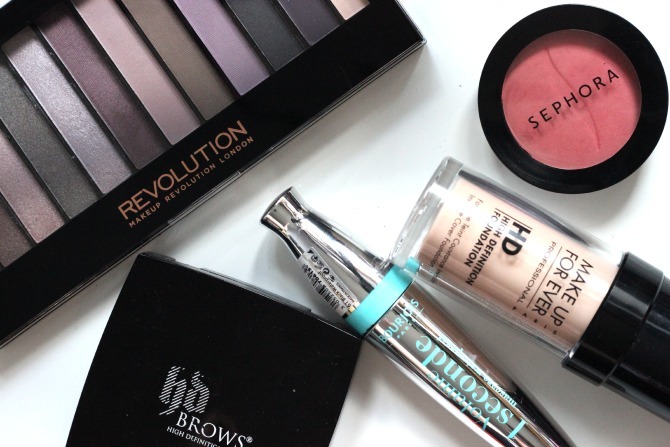 Hopefully you saw yesterdays review, if not, you can see in the pic above it's a pretty awesome mascara. It has the weirdest wand, with spikes and... balls. 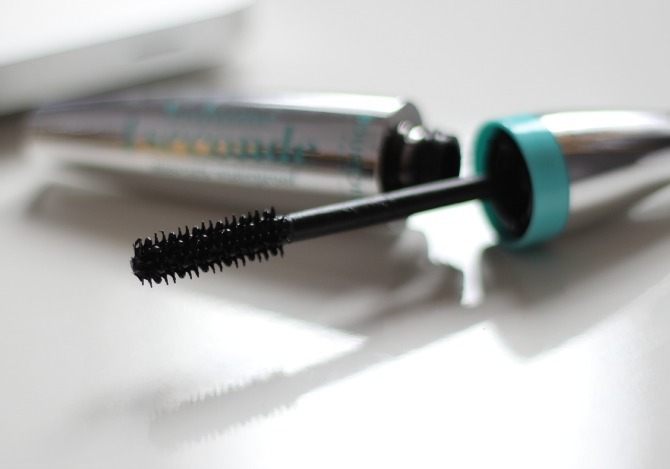 It doesn't clump, and it does a great job of making the most of your lashes. Also, because it's waterproof it doesn't budge all day and there's no drop-off from it on your cheeks. That does mean it's a bit of a bugger to remove though, even with Bioderma! If you've been reading my summer series, then you'll have seen me review this already, it's an absolutely gorgeous blusher with a hint of coral, perfect for adding a natural glow to your skin/face. This wand literally has balls, how random is that! 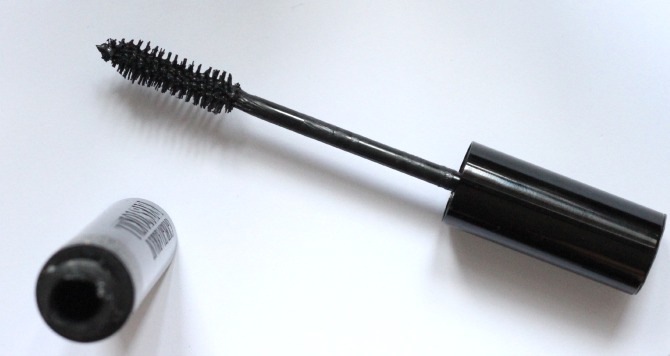 So, we have a new mascara review (available in stores for £9.99* in Boots or Superdrug)! 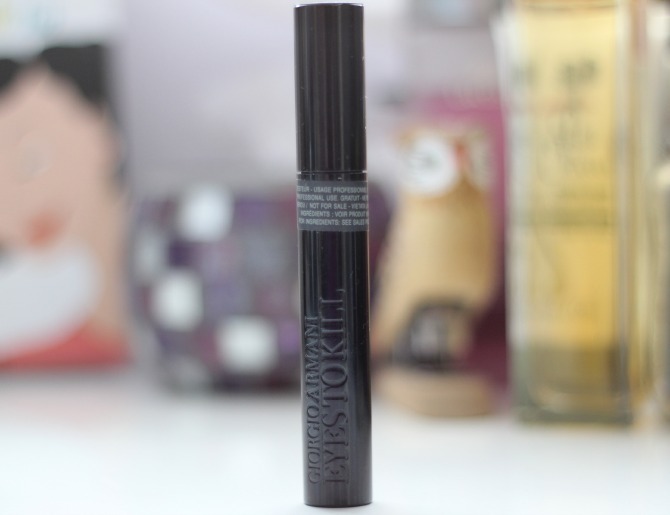 I'm not sure if I'm a bad blogger for this, but *whispers* before this I'd never tried a Bourjois mascara before *eek*. I'll slap my own wrist for that. So when this little beauty landed on my door mat, I might have let out a little squeal of excitement. 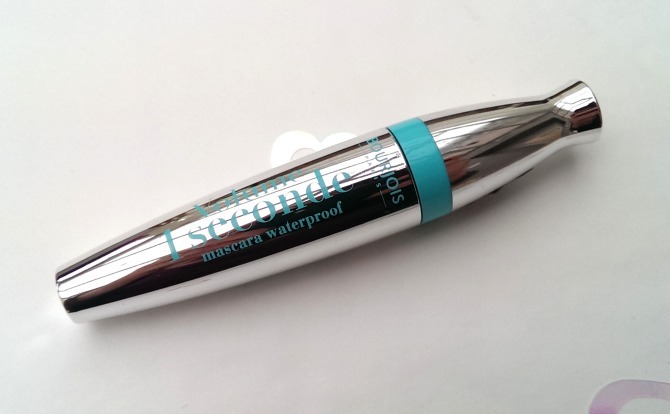 These are new mascaras that Bourjois have launched, this being the waterproof edition. Let me just say this, before I get into the review, when they say waterproof, they really do mean it! It took them being soaked in Bioderma and furiously rubbed to get this stuff off, after a full day's wear. So, how did it fair against those claims. In fairness, it knocked every last one of them out of the park. First up, the 16 hour hold. At the end of the night after wearing this all day, my lashes still have a curl (which it kindly gave them) and not a bit of it had budged, it still looked like I'd freshly applied it. Next - immediate coating. You know how some mascaras are great, but they take quite a bit of work to look like that, coating them again and again? Well, I didn't have to do that with this, it was very quick and easy to coat the lashes, I have it about 20 seconds between coats and I was good to go. Ultra black - yep, as you can see in the pics, this is a nice deep dark black formulation, exactly the type I go for. Eye catching design - I love the design of this (mirrored packaging), the only let-down is it can get hard to find it in your bag as it's mirroring everything around it :) However, it's shininess helps it stand out. 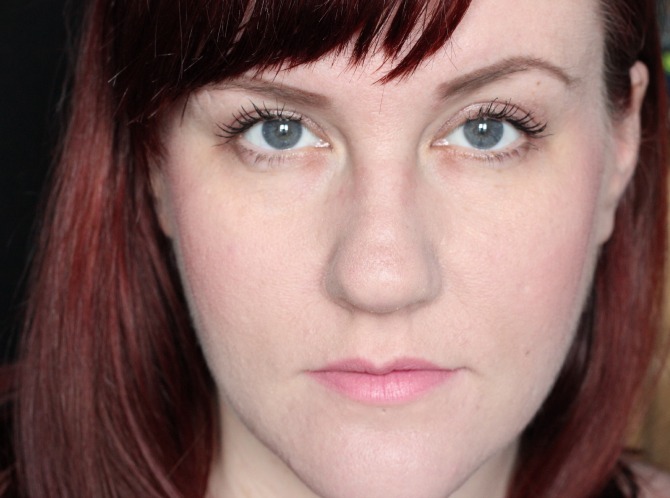 All in all, I really love this mascara, if it wasn't so much work to remove, I'd be wearing this every day. Now what I'd like is to get my mitts on the non-waterproof version of this to see if it lasts as well - any of you tried it yet? Personally I tend to stay away from dark colours in the Summer. When it's all warm and perfect for summer dresses, I tend to lean towards brights or pastels, which is where this little selection comes from. I really adore this pink for many reasons, first off, it looks like strawberry or raspberry ice cream, yummy! 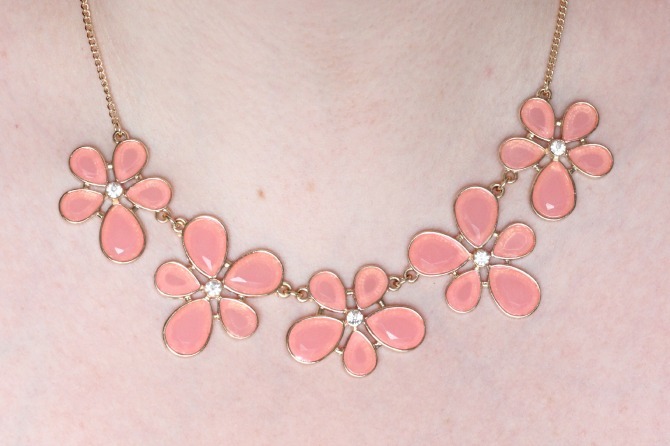 It looks amazing on any skin tone, and I love the quality of it. It's great at disguising ridges and almost giving your nails a fake look, like they're perfect and glued on :P It lasts really well, very long wearing before chipping and as with all Essie nail polishes, the applicator is decent too. Such a pretty shade! I love having this on my nails, it looks great with really pale skin like mine and despite it's budget price (around £2 if I recall) it lasts really well and has a decent price. Here's a tip, if you have this shade, or one like it, get hold of Chloe by Zoya - it's the perfect top coat for it - it's coral with holographic sheer fragments in it, very very pretty. Ok, not only does this have a very cute little name but it's an absolutely gorgeous colour that makes me really happy to look at :) I'm not a big fan of glitter polishes anymore, just because they're a nightmare to remove, that's why you'll find that most of my favs are cream shades. Teal nail polishes are probably my favourites, or shades like Essie's mint candy apple - they're all gorgeous! They make your hands look summery and pretty and personally, they just put me in a better mood as I see them moving across my keyboard while I'm writing blog posts or tweeting. 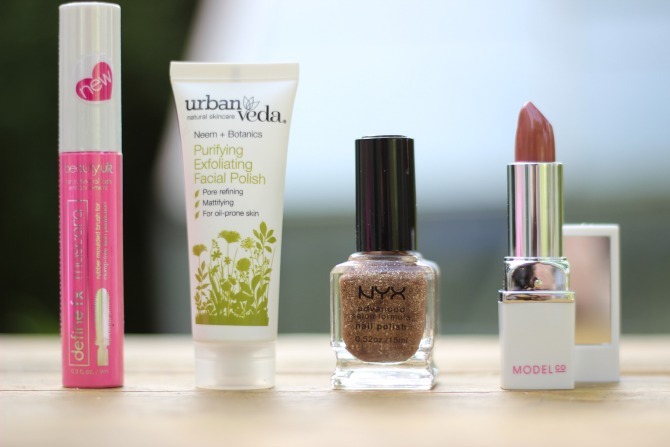 What's your favourite nail polishes for the Summer months?